And here is the brilliant story behind this scene from Megumisguy! Why was it look like from The Incredbiles with a newspaper said "X-RAY VISION PEEPING TOM". Love the way you do their fur. I can SO see this happening! Think Judy will get Nick's tail back? Женщинам любой породы никогда не понять этот жест.. Your art was so beautiful I had to write a story to go with it: Morning routines. Thanks! Glad you enjoyed it. With beautiful artwork like yours its easy to write a good story. 10 out of 10 for wicked imagination! 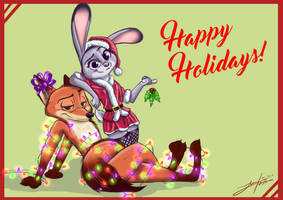 Love all of your Zootopia art. Keep it up! Certainly. happy to show my support, however small. Judy's annoyed, but she's probably come to expect things like this. At least Nick didn't call her cute! I like how Nick's towel is wrapped to accommodate his tail. There are some nice details here too, like the rust on the wall from the pipes and the toilet bowl not being immaculate. And, whether intentional or not, I like how Nick's toothbrush is the same color as a carrot. She looks a bit surprised and maybe a bit... aroused. Is this Nick's apartment? Great artwork!!! Keep it up. It's in the Judy's rented apartment. I know there wasn't a bathroom in her room, but what if there was some bathrooms on her floor? I think there were at least in one of my stories: Thinking of Her Fox. Please have a look. I sent you a PM with some stories that may help for your new Zootopia pictures. Good thing he didn't flush the toilet, then he might have been killed! It looks like it is going to take a little getting used to. Great drawing. Lots of fun.